Rope Bridge Rumble is the twenty-second level of Donkey Kong Country, and the twenty-first level in the Game Boy Advance remake (having switched positions with Torchlight Trouble). It is also the sixth and final level of the Gorilla Glacier area, and the fifth level in the remake. Taking place in the first treetop village since Tree Top Town, the Kongs are up to the challenge of using tires to cross numerous abysses in this level. However, many of these tires are on moving platforms, making them hard to reach at times. Also, the level is cluttered with the common enemies, Zingers, who are located all over the areas of the stage, mainly around the tires. These foes get in the way while the primates move along the tires, and even knock them off into the trees below. Along with many Zingers are Kritters and Armies. These dangerous foes can be found on flat areas and rope-bridges of the level. Though the level can be tough for the heroes, Winky the Frog appears here to help out. 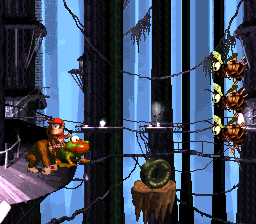 At the beginning of the level, the primates travel along several wooden planks that surround a tree. A gap with stationary platform supporting a tire within it follows. They can use the platform to their advantage by crossing the large gap with it. A Kritter marches on a solid bridge platform next to a ledge with another tire at the top of it. The Kongs must use the tire to bounce over a wide abyss and land on a separate platform with a third tire on it. As the heroes travel along this platform, an Army attacks them. They can reach a platform placed at a higher elevation with the assistance of a rubber tire protruding from the ground. This platform holds another tire that stands at the edge of it. An additional tire is placed on the following platform after a small gap. A platform supporting a tire floats inside of the gap. The letter K hovers above it, while a Zinger orbits the platform. Once they cross the gap and cross the area of planks, they can find a tire at the edge of the bridge. It can be used to cross an abyss just ahead with a Zinger flying above it. Another Zinger can be discovered orbiting a platform with a tire on it in the next abyss. The bridge platform following this has an additional tire at the end of it after a small ledge. The tire is required to reach a higher piece of ground, where another tire can be found. A gap is immediately after the tire with a small platform in it. A Zinger surrounds this platform, trying to attack the Kongs when they approach. Once the gap is crossed, the duo can find a DK Barrel wobbling on a bridge platform. A wide abyss is ahead with four platforms in it. A tire stands on each platform, and Zingers orbit some of them. The objects can be used to cross the pit and reach a bridge platform with some bananas hovering over it. Another platform like this just after a small gap holds the level's Star Barrel. The group approaches the letter O. After passing the barrel, the heroes discover a small gap with a Kritter bouncing along the edges of it. The letter O floats in the pit. Two bridge platforms are ahead, and they are both connected by a long, straight bridge with several bananas on it. The bananas are too high up to reach with a jump, but the two friends can get to them if they bounce on a nearby tire to land on a platform that moves under them. After the second bridge platform, they approach another gap with two Kritters hopping over it. A Banana Bunch is suspended over the pit, which is followed by a bridge platform supporting a Kritter. A platform holding a bouncy tire moves back and forth in a horizontal path in the abyss to the right of here. The letter N is located in the air above it. On the opposite side of the abyss, the heroes can find a bridge platform with another gap on the other side of it. The gap must be crossed with the use of two moving platforms that support tires. As they travel on the platforms, Zingers stand in their way. In the center of the gap, they can discover a stationary platform with a DK Barrel on it. Once the primates walk across the bridge platform on the other side of this abyss, they can find another gap that is much smaller. As before, two Kritters hop over it, and the letter G hovers above it. Another bridge platform is ahead of here with a sign on it that indicates that the level is almost over. A barrel sits on a raised part of the bridge. In a wide gap located east of here, the Kongs can find three platforms that move back and forth in a horizontal path. Each platform holds a bouncy tire, and they must be used to cross the whole abyss. Once it is passed, Donkey and Diddy find themselves on a bridge platform with a ledge on it. An Army waits to attack them at the top of the ledge. A wide pit follows with a wall of three Zingers within it. Using a moving platform with a lone tire on it, the two primates must bounce over the wall and make their way onto a pair of bridge platforms with an exit sign between them. If the heroes enter the hut to the right of the sign, they complete the level. K: The letter K hovers above a platform in the fourth abyss in the stage. A Zinger orbits the platform, which supports a bouncy tire. O: The heroes can spot the letter O in the first gap from the Star Barrel. A super-jump is required to reach it without falling. N: The letter N is high in the air above the third gap from the Star Barrel. A platform supporting a tire floats in the gap. They must bounce on the tire to reach it. G: A sign indicating that the level is almost over can be found shortly before the exit. The letter G hovers in the gap immediately before it. A super-jump must be performed to grab it safely. At the beginning of the level, jump into the second pit to land in a barrel that shoot them to a Bonus Level. In the bonus, they must bounce off of many tires placed on small platforms to cross gaps and collect bananas. A crate with Winky in it is at the end of the stage. 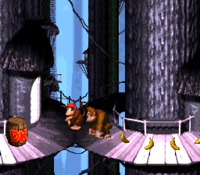 The Kongs can get on the Animal Friend and exit the stage through a small door. Right before the last pit, the heroes travel over another abyss with several tires and platforms. As they go, they can find a lone banana in the air. If they jump up to it, they land in a barrel that shoots them into a Bonus Level. There, they must hit three barrels, all containing a moving image, so that the pictures of Animal Tokens on them all match. When this match is made, the heroes are awarded with a certain Animal Token and taken out of the special stage. If they fail to make a match, they are forced back into the main level without a prize. From the exit to the first Bonus Level, the Kongs should head backwards onto the previous platform to find a camera icon high in the air. They can reach it with a nearby tire. The icon gives them a photograph of themselves in an area similar to Tree Top Town, which is located on the fifteenth page of their scrapbook.